Carmelo’s food is an exciting fusion of traditional and contemporary Italian styles with his own touch of imagination and ingenuity. Carmelo’s food reflects his passion to work with the freshest produce available. ANZAC DAY TRADING HOURS – We are OPEN from 6pm on Thursday 25th April, 2019. 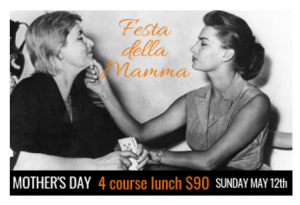 MOTHER’S DAY LUNCH – SEE MENU Celebrate ‘festa della mamma’ Italian style with a 4 course lunch – $90pp. We are open all day and taking bookings from 12pm onwards. Set menu for lunch and a-la-carte available for dinner. Children’s menu available. Bookings essential – call 93313333.